After the semifinals whereby Robin Soderling swiftly bounced second seed Nikolay Davydenko and Mikhail Youzhny eliminated top seed Novak Djokovic in straight sets; there was great hope for a sensational final at the ATP 500 ABN AMRO World Tennis Tournament. Lamentably, the match ended with Youzhny bowing out due to hip injury. Thereby, Soderling prevailed 6-4, 2-0. After a dream 2009 season, Soderling had a nightmarish commencement to 2010. Prior to this week, with first round defeats in Chennai and Melbourne, the Swede had yet to record a victory on the ATP tour. Soderling’s faith was tested the first game. After opening with an ace, Robin made scores of errors leading to Mikhail breaking. However, with an overhead winner, Soderling had a chance to get on the board. The Swede did so when a 25 shot rally terminated with the Russian’s forehand finding the bottom of the net. Soderling then carried his next game at love for 2-1. With a forehand up the line winner, Soderling had his second break opportunity. Robin converted when Mikhail double faulted. The primary indication of a Youzhny injury came before his serving at 1-4. The Russian was treated on court. Youzhny temporarily blocked out the problem saving a tough game for 2-4 and holding at love to force Soderling to serve for the set. As a result of a litany of forehand miscues by Soderling, Youzhny captured the break for 4-5. But, serving to equalize the set, Youzhny coughed up three backhand mistakes for double break point. Helped by a net court winner, Soderling bedded the first set. After Soderling easily seized the initial game of the second set; courtesy of Youzhny’s backhand breaking down, the Swede had triple break point. As the Russian dumped another backhand crosscourt into the net, Soderling had a 2-0 lead. At that point, with Youzhny’s mobility severely restricted, he elected to pull the plug on the match. 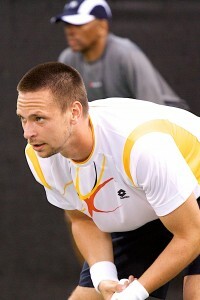 Soderling, seeded third, had received a wildcard entry. The runner up in 2008, Rotterdam represents Soderling’s most prestigious career title and the fifth overall, all indoors. The elated Swede cited that the main thing for him was “looking for [his] form the first couple of matches”. Soderling expressed his gratitude to coach Magnus Norman who during this “up and down week” kept encouraging him. In terms of his prior poor postings, Soderling believes that fatigue played a part. With this win, Soderling is hopeful that he is back on the right path. With a wrist injury stopping him at the Australian Open, this was Youzhny’s comeback event. Therefore, for the 2007 champion, this was frustrating in light of his great performance in the semis. The Russian apologized to the spectators for having to retire, “I have [an] injury, I cannot move well”. 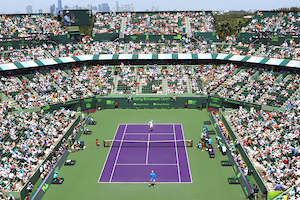 Nevertheless, Youzhny had a terrific tournament including a victory over fourth seed Gael Monfils in the quarterfinals. From the 20th spot, Youzhny’s ranking will climb further.